See where your organisation stands at the moment. This test was developed in 2008-2009 with companies in Sweden and Germany, mostly embedded software development companies. 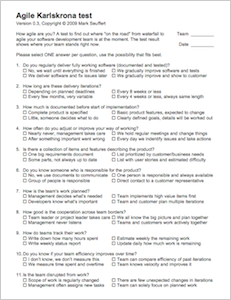 Use this self-assessment to see how far an agile adoption came and to monitor progress over time. 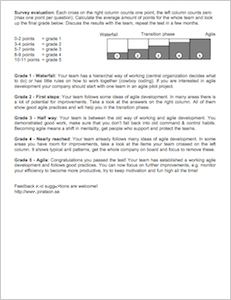 It's too easy to claim "we are agile". Background: Since organisations are made up of people, collaboration and adaptability are important factors of how well an organisation performs. Tip: Discuss with your teams where support is needed. Get support.